Contributed photo / Tripp Phillips, right, pitches his product Le-Glue on the TV show "Shark Tank." Phillips' business won an $80,000 investment. Contributed photo / Tripp Phillips and sister Allee are also business partners in Le-Glue. 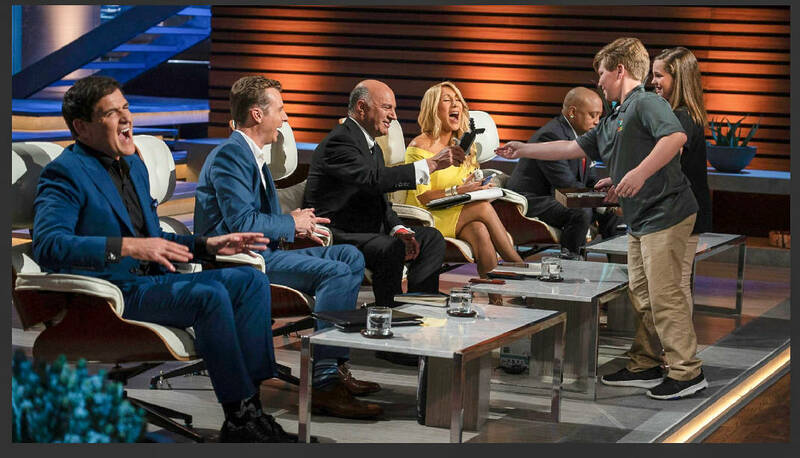 Dalton, Georgia, 13-year-old Tripp Phillips said appearing on the hit TV show "Shark Tank" to pitch his business idea was "cool and weird." "I had watched those people for multiple years," said the Dalton Middle School student. Last year, he won an $80,000 investment from one of the show's "sharks" for Le-Glue, a product that bonds building blocks such as Legos but releases them after immersion in warm water. While Tripp's business scored on "Shark Tank," it was earlier winning Dalton's first annual pitch competition that helped him refine his presentation for TV. Organizers of the Dalton Innovation Accelerator are hopeful the winner of this year's pitch competition, where business people try to sell their ideas, can duplicate the success of the teenager and his company. Barry Slaymaker, one of the accelerator's founders, said the submission period for this year's Dalton competition is open through June 15. The pitch competition, which will take place Oct. 8, offers prizes for the winner including $5,000, office space in downtown rent-free for six months, a website package and more, he said. Slaymaker said that Tripp appearing on "Shark Tank" was "a huge win for us. We're hoping the competition will be as good, if not better than, last year." He said organizers are opening up the pitch competition this year to people from Chattanooga to Rome, Georgia. Lee Phillips, Tripp's father, said the most valuable part of winning the Dalton competition wasn't the money, but the services they received from a lawyer and boosting the product's website. The "Shark Tank" experience "exploded our website," he said, noting that Le-Glue sales this year are expected to hit between $400,000 to $500,000. Phillips said his son speaks in public regularly about Le-Glue, a product with its origins in a school assignment Tripp received in third grade to come up with an invention to solve a problem. Tripp told his father about his idea to bond Lego creations, but not permanently. His father started researching the idea, using his knowledge running a textile testing lab, and they uncovered a base formula for what they wanted to do. The Lego bricks, even if they're glued together for as long as a year, can be taken apart undamaged with just water, Phillips said. He said there are four partners in the business — Tripp, his sister Allee, himself and Kevin O'Leary, who invested $80,000 for a 25 percent interest. The business employs a couple of part-time employees, Phillips said. In addition to the website, 60 to 70 small retailers have picked up the product, including Learning Express Toys in Chattanooga, he said. Tripp, who said he's undecided if he'll pursue a business career after school, recommended that people with an idea enter the Dalton pitch competition. He said that he went through hours of practicing that ultimately benefited him on "Shark Tank." Slaymaker said that in this year's pitch competition, each applicant will take part in "a way-finding meeting" with local community leaders, including investors, business professors and entrepreneurs. The advisory panel will look at the market opportunity for the idea, the overall business model, the capabilities of the management team, and the strength of product or service offering, he said. Then applicants can go through a business boot camp to help form their ideas into business plans, Slaymaker said. If the applicant already has a business plan, more way-finding is available until the semifinalists are announced on Aug. 30. Semifinalists receive continued mentorship from the business leaders. Slaymaker said there were 60 applicants last year. "There was a pent-up inventory of great ideas," he said. "We'd love to have even more than last year."